The Mobility Service Installation program cannot run successfully unless you have properly prepared the environment where you run it. Ensure that the Linux server where you plan to install the Mobility Service meets the system requirements listed in Section 2.0, GroupWise Mobility Service System Requirements. Ensure that the Mobility server has a static IP address. Ensure that the Mobility server has a valid hostname. If your SLES server is properly configured, this command returns the hostname of the server. In YaST, click Network Devices > Network Settings. In the Hostname field, specify the hostname of the Mobility server, then click OK.
Repeat the hostname -f command to verify the hostname. Ensure that the Linux operating system media is available. The Mobility Service Installation program might need to install additional operating system RPMs that are required by the Mobility Service. The Mobility Service Installation program can access the operating system files on a DVD or in a repository that is available from an FTP site or a web server. Continue with Opening Required Ports. The GroupWise Sync Agent initially communicates with the POA that you specify during Mobility Service installation on the SOAP port that you specify. 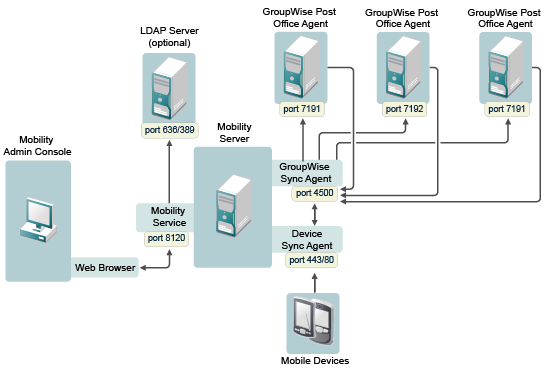 As users connect their mobile devices, the GroupWise Sync Agent determines from the initial POA the IP addresses and port numbers of all POAs where mobile device users have their mailboxes. Therefore, the GroupWise Sync Agent can communicate with multiple POAs throughout your GroupWise system. Continue with Verifying GroupWise System Availability. Ensure that the GroupWise trusted application key for the GroupWise Sync Agent is accessible to the Mobility Service Installation program on the Mobility server. For more information, see Creating a Trusted Application and Key in the GroupWise 2014 R2 Administration Guide. Ensure that the GroupWise POA that the GroupWise Sync Agent will communicate with is configured for SOAP. Ensure that the GroupWise POA is currently running. Continue with Verifying Certificate Availability. Ensure that the certificate file is accessible to the Mobility Service Installation program on the Mobility server. (Conditional) If the key file that you received with the certificate included a password, ensure that the password has been removed. (Conditional) If you received the certificate as multiple files, ensure that you have combined the files into one certificate file. For instructions, see Securing Communication between the Device Sync Agent and Mobile Devices in the GroupWise Mobility Service 2014 R2 Administration Guide. (Conditional) If you chose to use YaST to generate a self-signed certificate, ensure that it was created to include the specific DNS hostname of the Mobility server. Continue with Installing the Mobility Service. For device-specific certificate issues, see GroupWise Mobility Service SSL Issues.